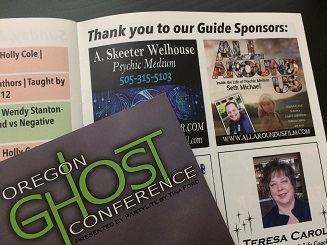 Promote Your Business by Sponsoring the 2020 Oregon Ghost Conference! a) Download a Printable PDF. b) Print out form, fill it out and sign by hand. a) Pay for your Ad/Sponsorship online below. b) Download the Fillable PDF and Save to your desktop. c) Open it and fill it out. One (2.5"w X 2.5"h) full color ad in 2,500 copies of the official 2020 Oregon Ghost Conference Program, distributed to all conference attendees and local Seaside businesses. One (5"w X2.5"h) full color ad in 2,500 copies of the official 2020 Oregon Ghost Conference Program, distributed to all conference attendees and local Seaside businesses. One single color (white) logo featured on the back of the official 2020 Oregon Ghost Conference T-shirt. 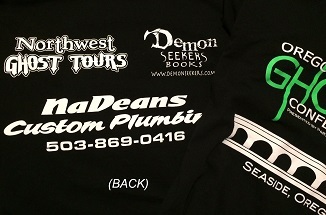 Attendees wear these shirts all over the Northwest to Paranormal Events throughout the entire year. 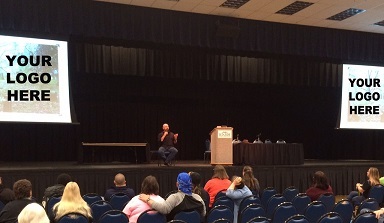 Full color logo or ad projected on stage between each speaker presentation. One single color (white) logo featured on the back of the official 2020 Oregon Ghost Conference t-shirt. 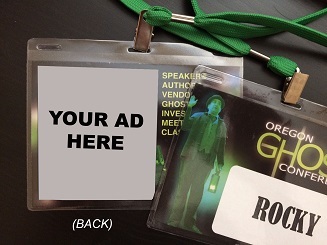 Your printed 3"w X 4"h full color ad featured on the back of name badges for all Oregon Ghost Conference attendees. One single color (white) logo featured on the back of the official 2020 Oregon Ghost Conference T-shirt. 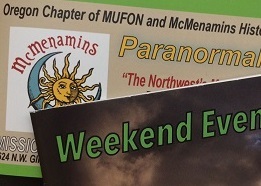 Attendees wear these shirts all over the Northwest to Paranormal Events throughout the entire year. One 5”w x 2.5”h full color ad in 2,500 copies of the official 2020 Oregon Ghost Conference Program, distributed to all conference attendees and local Seaside businesses. 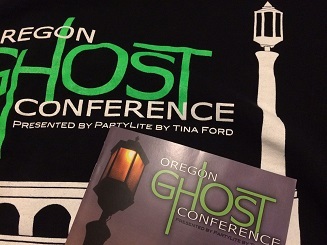 “2020 Oregon Ghost Conference, presented by (your name here)” on all materials, including front of T-shirt. Web banner in prominent location on the Oregon Ghost Conference Home Page. Free prominent booth space at the conference: includes electricity, One 8’ x 30” table with covering, 2 chairs and 2 General Admission Passes to the Vendor/Speaker Area of the conference. One single color (white) logo featured on the back of the official 2020 Oregon Ghost Conference T-shirt. One full color logo or ad featured during a rotating slideshow on screens throughout the conference site. Rotating slideshow will feature conference schedule, events, and sponsor slides. One full page (5"w X 8"h) full color ad in 2500 copies of the official 2020 Oregon Ghost Conference Program, distributed to all conference attendees and local Seaside businesses.